Pleading the Sixth: In these days of political strife and partisan antagonism, it is encouraging to see that government can still work and reach consensus for the benefit of the people, as demonstrated by the near unanimous passage of a comprehensive indigent defense reform bill in Utah. Part I of this report explains the new reforms and the consensus approach from which other states can learn. Part II explains the historical underpinnings of Utah’s courts that give us optimism for the right to counsel in Utah and offers lessons for achieving the best paradigm of justice everywhere. 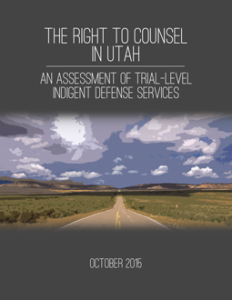 SB 155 seeks to address the fundamental problems identified in the Sixth Amendment Center’s (6AC) report, The Right to Counsel in Utah: An Assessment of Trial-Level Indigent Defense Services. Namely, Utah’s trial courts currently do not uniformly provide counsel to indigent defendants at all critical stages of criminal cases as required by the U.S. Supreme Court, with many defendants – particularly those facing misdemeanor charges in justice courts – never speaking to an attorney. Those defendants that do receive representation too often receive an attorney who operates under multiple conflicts of interest arising from unfair contractual arrangements that produce incentives to curtail zealous representation. The challenge of providing effective representation for each client can be exacerbated by an excessive caseload that reduces the time a lawyer can spend on an individual case. And, these attorneys generally lack appropriate independence from undue state and local governmental interference with securing the necessary resources to put the state’s case to the test. The primary cause of the institutionalization of these practices is the lack of accountability inherent in the system. Most states eliminate the potential for direct governmental interference with the right to counsel by establishing an independent commission to oversee the defense function. Following the recommendations of nationally recognized standards of justice, such states achieve constitutionally mandated independence by insulating right to counsel services under a board made up of members selected by diverse appointing authorities, such that no single branch of government has the ability to usurp power over the system. A special Defender Commission should be established for every defender system, whether public or private. The Commission should consist of from nine to thirteen members, depending upon the size of the community, the number of identifiable factions or components of the client population, and judgments as to which non-client groups should be represented. Commission members should be selected under the following criteria: The primary consideration in establishing the composition of the Commission should be ensuring the independence of the Defender Director. (a) The members of the Commission should represent a diversity of factions in order to ensure insulation from partisan politics. (b) No single branch of government should have a majority of votes on the Commission. (c) Organizations concerned with the problems of the client community should be represented on the Commission. (d) A majority of the Commission should consist of practicing attorneys. The Utah Legislature recommends one member selected jointly by the Speaker of the House and the President of the Senate. The Utah Judicial Council and the Commission on Criminal and Juvenile Justice (UCCJJ) appoint the remaining two voting members. The Utah Judicial Council – a 14-member body of the judicial branch charged with the promulgation of uniform rules and standards to ensure the proper administration of justice across the state – directly appoints a retired judge to the UIDC. The Executive Director of the UCCJJ, or his designee, also serves on the UIDC. The UCCJJ is a governmental entity made up of 22 criminal justice stakeholders created to achieve broad philosophical agreement concerning the objectives of the criminal justice system. Finally, the two non-voting members of the new commission are a representative from the Administrative Office of Courts (appointed by the Judicial Council) and the Executive Director of the UIDC itself. counsel shall be free to provide meaningful, adversarial testing of the evidence, including adequate access to defense resources and workloads that allow for time to meet with clients, investigate cases, and file appropriate motions. The UIDC is additionally charged with ensuring that service providers are adequately compensated and to develop data collection procedures to ensure uniformity from jurisdiction to jurisdiction regarding attorney performance. The UIDC has express statutory authority to accomplish these aims, along with the authority to review, investigate, and enforce UIDC standards on local systems. Sen. Weiler also notes that “the legislature will be providing grants or matching funds for the first time to help offset the costs for local politician subdivisions.” That is, SB 155 includes the first ever state funding of trial-level public defense services in Utah (isolating Pennsylvania as the only state in America with no state funding of the constitutional right to counsel). UIDC is statutorily required to develop policies and procedures for how best to disseminate these new monies. However, it is important to note that all local governments are bound by UIDC standards whether they seek state funding or not. Although some local advocates were discouraged that SB 155’s state funding was reduced from the proposed year one budget of $3 million to $2 million, the funding reflects the anticipated time it will necessarily take to get the UIDC up and running. Upon the signing of SB 155 by the Governor, the act will take effect in May 2016. It will then take several months for nominating authorities to make recommendations to the Governor, for the Governor to make appointments and the Senate to consent, and for the UIDC to set meetings. From there, the UIDC will have to advertise for the position of Executive Director, interview candidates, and make a hire. The Executive Director will necessarily then have to go through a similar process to hire staff while assisting the UIDC to develop policies and procedures for the dissemination of state money. 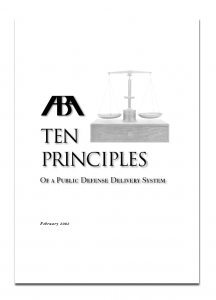 The reform process began back in 2008 when the Utah Judicial Council created a Study Committee on Appellate Representation of Indigent Criminal Defendants to examine the delivery of right to counsel services in appeals. Its January 2011 report determined, among other things, that the prevailing use of flat fee contracts created significant financial and ethical hurdles to quality appellate representation. Recognizing that some of the identified appellate issues may be exacerbated by similar contracts at the trial level, the Judicial Council reconstituted the appellate committee to look at trial-level services and included representatives from the judiciary, the executive branch, the legislature, the attorney general’s office, the prosecuting attorneys’ association, the criminal defense bar, and the association of counties, among others. The study committee retained the services of the 6AC through a generous grant by the U.S. Department of Justice, Bureau of Justice Assistance. Rather than playing “gotcha” politics, the 6AC recognized early on that the problems with the right to counsel were so complex in Utah that it was best to present issues to the committee even while a ten-county evaluation was still being completed. This allowed the diverse stakeholder group to debate the underlying problems and begin thinking of solutions all throughout the evaluation process. Indeed, the insights of prosecutors and local governments were incredibly helpful to the 6AC in understanding the systems assessed. Upon receipt of the draft report, the study committee requested that they be allowed to work over the summer of 2015 to develop Utah specific answers to the problems. Because of the consensus approach Utah was taking and the seriousness and respect with which the study committee did their work, the 6AC heeded the request such that the report and solutions adopted by the Judicial Council could be presented at the same time the report was released. From there, Sen. Weiler took the lead in drafting SB 155 with continued input from all of the stakeholders. Click here to go to Part II of this report.